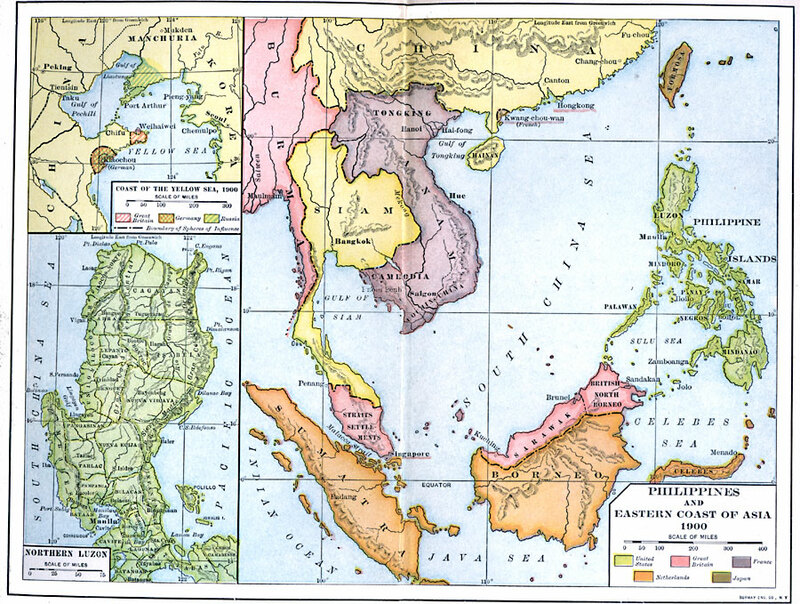 Description: A map of the Philippines and East Asia in 1900 showing the political boundaries and foreign possessions at the time. The map is color-coded to show the possessions of the United States, Great Britain, France Netherlands, and Japan. The map coverage includes the Islands of Formosa (Taiwan), Sumatra and Borneo, and the countries of Siam (Thailand) and the Malay Peninsula, the French Indo–China countries of Tongking, Annam, Cambodia, and Cochin China, and portions of Burma and China. The map shows capitals and major cities, rivers, terrain and coastal features, and islands of the region. The map includes insets detailing the northern portion of Luzon (Philippines), and the foreign possessions in the Gulf of Pechili (Bohai Gulf) and Chinese coast of the Yellow Sea, showing the Russian control of Port Arthur in Manchuria, the German control of Kiaochou (Jiaozhou Bay), and British control of Weihaiwei. This inset map shows the northern terminus of the Grand Canal in Tientsin (Tianjin).